FYI: The HGH used in homeopathic sprays is the same somatropin that is used in injections but it has gone through the homeopathic process and so does not require a prescription. Some companies and/or distributors claim their spray product contains human growth hormone and it is not in homeopathic form. They claim their product is like the injections and contains the most "nanograms" of HGH (example: 30,000 ng), and some have even made up a new category that they call the "supplemental HGH" category. This is all nothing but sales hype! They want you to believe their product is different and can give the body a larger dose of human growth hormone than the homeopathic sprays. This is completely untrue. A dose of non-homeopathic HGH requires a prescription and must be injected due to the large size of the molecule. Also, any product that has (ng) on the label is not FDA registered. 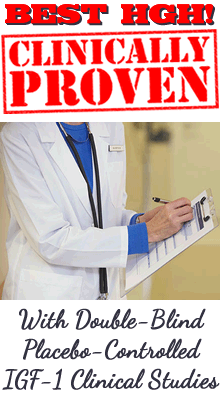 Proper homeopathic products that are FDA registered will give the amounts of the ingredients in potencies such as "30X" or "12C". 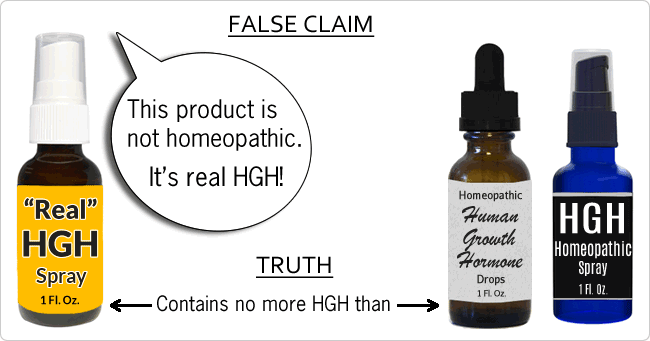 Please understand that the most that any non-injection HGH product can be is homeopathic, but whether their product is homeopathic or not it still cannot contain any more human growth hormone than homeopathic products. However, since their product can only contain homeopathic amounts of growth hormone, if it hasn't been put through the extensive homeopathic process to activate and potentiate the formula it cannot be effective. Distributors making such claims may not know much about how HGH products work but they are now selling them and this is one false claim they may use. During the homeopathic process the electromagnetic properties and energies of the human growth hormone molecules are transferred into the lattice of the water in the base solution, which makes it potentiated and effective. This solution is then absorbed successfully under the tongue. Homeopathy is a very different type of medicine than what many of us are used to, yet it has been used effectively throughout the world for over 200 years. It may be hard to understand how a product can produce results if it does not contain a large dose of a drug but homeopathic products do not try to give the body all the growth hormone it needs. Homeopathic products can be very effective because they can deliver the electromagnetic energies of the original HGH molecules and can also work with the body to help the pituitary gland to produce and release a more healthy amount of its own human growth hormone. I believe the reason why some sellers claim their product is not homeopathic is because they assume that many people do not understand how homeopathy works, and so they will incorrectly think that more nanograms must mean the product is better. Sellers also know that in the past some in modern Western medicine have refused to acknowledge the effectiveness of homeopathy and other alternative therapies. As a licensed member of modern medicine myself for the past 36 years I know that alternative medicines such as homeopathy have been looked down upon by members of our medical community, and have also been thought of as competition. Thankfully more and more members of modern allopathic medicine are now realizing the effectiveness of alternative medicines and some are even being crossed trained. 1: Non-homeopathic human growth hormone still requires a prescription and these companies/distributors do not have an exclusive arrangement with the FDA to sell it OTC (over the counter). 2: A dose of non-homeopathic HGH must still be injected due the the large size of the molecule and no polymer matrix or other special delivery system can change this fact. Proper Potency of Homeopathic HGH - What is "30X"?